In the beginning of Letter of Marque, the Doctor was hurrying across country on foot to join the Captain for the beginning of a voyage. As he walked, he came across a fellow amateur naturalist who told him that bustards (Otis tardus aver male 15 to 22 kg, females 5 kg.) were nesting in a near-by clearing. The Doctor was unable to resist, and his delay made him very nearly miss the sailing. Dr. Maturin apologized to Captain Aubrey for his "gross self-indulgence in bustards". Despite the failure of naval courtesy, I think the Doctor was right to take the time to observe the birds. 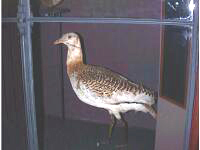 Bustards were fast disappearing from England, and in another 25 years they would be gone. This is a female on the left, and the males look about the same with long pairs of feathers like a mustache on either side of the beak. As you can guess from their size, they are ground nesting birds. And they do not allow human to approach their nests closer than 100 yards. 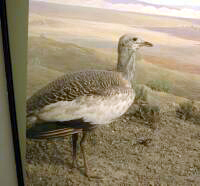 When the population of England grew, and more and more land was taken over for humans and their use, there was no space left for the great bustard. You will probably be able to guess from their size and their long legs that they are poor flyers and pretty good runners. Also their size suggests that they can't be too fussy about their diet. And in fact they eat pretty much whatever they can get – seeds, buds, insects, and small vertebrates. They are presently endangered and what is left of their range is in the less populated parts of central Asia. Both the Captain and the Doctor saw English birds in England.